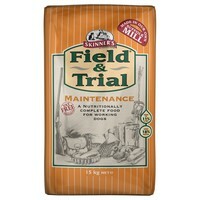 Skinners Field and Trial Maintenance Dog Food contains easy to digest chicken, providing the correct level of protein for the maintenance of strong muscles, teeth and bones. Specially formulated to meet the needs of working dogs, undertaking light to moderate work or in the closed season. Free from artificial flavourings, colourants and preservatives. Whole wheat, maize, poultry meat meal, barley, chicken fat, full fat soya bean meal, sugar beet pulp, vitamins & minerals. Excellent product used by breeders for puppies....this is perfect for 5yr working picking up retriever, although I supplement with a can of meat and water so don't use it dry. Our dogs have been on this for a number of years now and thrive on it, their coats are lovely and glossy, no upset tummies. There is never any left in the bowl! My dogs thrive off skinners ,Our dog club reccomended it,only food that is better than it is raw for our boys....better than most top priced kibble too. We used to have 12 huskies but as time goes on they got less and we now have 6. We have used Skinners for a long time and we wouldn't change it as most of the dogs passed away with old age - so I would say its down to love and good food and they are well feed. I've been feeding my dogs this for the last 6 months my dogs look in fantastic condition. One of my dogs has a very sensitive stomach and we've had no complaints since we switched to this and we've tried all kinds of food. my 3 dogs are at the peak of fitness and there coats shine with this feed, best on the market!!! Really happy with this product so far. I used to feed my dogs Bakers and whilst it agreed with them and they were in good condition, I didn't like the fact that Bakers add so much sugars etc which are just not necessary. I've been using this type of Skinners for 2 months and they love it - polish it off within seconds! 2 of my 4 dogs are agility dogs and this product seems to work well with them. Would recommend! Thank you Tania for your comments. We were feeding our dog the muesli mix - which he loves- but all that sugar was giving him terrible tartar on his teeth. We have switched to this formula. He definitely prefers it with a few leftovers! All the varieties in Skinners suit all my foster dogs as well as my own pet. This particular one my dog won't eat unless something else is added which presumably means its too bland for him. I don't give them the sugar coated varieties as I think it unnecessary to feed sugar to dogs as it is hard enough to keep their teeth and breath nice, so I avoid the muesli and ruff & ready even though the dogs like them and they get on with them. I think the Skinners is value for money and does the job, but I don't understand the big price differences between the varieties.